Most women know how to apply makeup. Truth be told, women play with makeup as early as they are little girls. Playing with your mom’s makeup is always fun, and girls want to do it. Which means practice, and by the time we are in our adulthood, we know all of the basic. But if you’ve ever been to a professional to get your makeup done, you know the difference between how your makeup looks, and how a professional makeup looks. With that in mind, today we want to share with you 7 makeup tutorials that will help you learn how to apply makeup like a professional. Do not worry, it is not hard, and these guys really go over the board of sharing tips and guides. Why not take your makeup to the next level? We have the means to help you get there. Kim Kardashian was the one that started the trend of contouring. To be fair, contouring has been around for many years even before Kimmy showed up. We will show you her tricks later on. For now, let’s start with the basic principles of contouring. 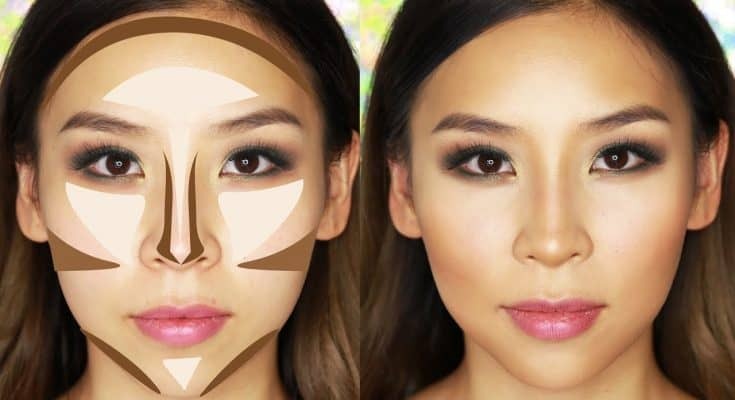 You might ask, why do you need contouring? And what is the purpose of it? Simply put, contouring creates a dimension in your face. And when you need to take a photo of you, think wedding photos, or graduation photos, an extra dimension comes in handy. Otherwise, your face might look and fall flat on the pictures. The basic areas where you put contour are the along the sides of your forehead and temples, in order to create a balance between the upper and lower half of your face, as well as the area directly below cheekbones, and the very tip of your chin. With that in mind, watch the video for some useful tips for beginners. Speaking of contouring, we have to have the Kim Kardashian guide. Now, bear in mind, this tutorial might be a bit drastic for casual and everyday usage. You do not want this makeup look when you are going out just for a cup of coffee. However, when you need a glam look, and you are going out at night for a date or something, you just have to try it. If you use the same products as in the video, there will be not much shine, and it will look more natural compared to other looks. In the end, it comes down to what you want and needs from your makeup look. We can agree that foundation is one of the most important steps in applying makeup. It is the same way as you are building a house. No good foundation and groundwork, and your house will not stick. The same goes for makeup. If you do not apply foundation properly, which means the right foundation for your skin and proper technique, your makeup will look awful, almost dull. What you will learn in this video is that contrary to popular belief, the foundation does not need to be full coverage all the time. You just have to use it to cover certain areas like redness. The most important aspect of applying a foundation like a pro is color matching and even application. Blend it out evenly to get a flawless finish. When it comes to applying makeup, we usually put the biggest emphasis on our eyes. And it is only natural, eye makeup can make or break your look. Do it right, and you will open up your beautiful eyes. Do it wrong, and you might look like an angry PMS woman that wants to kill anyone she meets. With that in mind, knowing how to apply eyeshadow takes practice. The more you put on yourself or on others, the better you will get. We want to start off with a simple and basic eyeshadow tutorial. You can do it just like the professionals, and you will also learn what type of eyeshadow products to use. Bear in mind, this is a simple guide for beginners. As you get better, you can experiment with different colors and styles. Where you apply blush depends on the shape of your face. For example, if you have a round face, you need to sweep it along your cheekbones. And if you have a heart-shaped face, you need to apply just below the apples. But no matter your face shape, there is one place where you should never apply blush. At least according to professionals. If you are applying blush to the apples of your cheeks, you are doing something wrong. In this short video, you will learn how and where to apply blush, and what you might do wrong that will end up in a disaster. The trend when it comes to eyebrows often changes. Some years ago, we were living in the era of pencil thin eyebrows. Now, we are living in an era of thick eyebrows. The more volume, the better. And it can be hard to get there. Especially if you do not have thick eyebrows. You can try growing and improving the growth of your eyebrows, but there will always be some spots that require a little bit more work to do. For that purpose, you have to learn how to fill eyebrows. In this video, you will learn exactly that. And they will look as natural as possible. It is absolutely life-changing. We talked about how to apply eyeshadow, regarding a basic and simple look. Now, we want to take things to the next level. In this video, we go in an in-depth tutorial on how to blend eyeshadows. It is arguably one of the hardest parts of applying makeup. A lot of women make a mistake when it comes to blending eyeshadows. Blending is true art, and if done incorrectly, your eyes might look smudged and overly dark. Try this tutorial to get the right technique.